Iâ€™ve been puzzled why Richard Thalerâ€™s â€œnudgeâ€ idea attracts such hostility from some people to my political left (including very smart people such as Henry Farrell and Cosma Shalizi). The worst thing you can say about nudging as I understand it is that it’s not very powerful; other than that, nudging is like chicken soup: it can’t do any harm. So Iâ€™m grateful to Tyler Cowen for clarifying matters for me. Either Cowen or I badly misunderstands Thalerâ€™s idea; if Cowen is right, you can add me to the list of anti-nudgers. But Iâ€™m pretty sure the Cowen is wrong about what Thaler says, and certain that his account confuses things that ought to be distinguished. Nudging, as I understand it, involves changing â€œchoice architectureâ€ â€“ altering the way options are presented or the time choices are made, or changing the â€œdefault outcomeâ€ if no option is explicitly chosen â€“ in order to bring peopleâ€™s actual choices more closely in line with their true preferences, as measured by the choices they would make with full information after serious reflection. That is, nudging is simply the opposite of temptation. One of the defining features of a nudge (understood this way) is that it doesnâ€™t narrow the range of outcomes available to the chooser. For example: presented with a menu of retirement-savings options, many employees will pick none of them, in part because of the psychological costs of decision-making and the fear of getting it wrong (“analysis paralysis”). This can be true even in the case when inaction is clearly the worst option (e.g., when the employer is picking up all of the cost). In that case, a nudge strategy would be to make enrollment in the plan that seems to experts most appropriate for the largest number of employees the default option: i.e., what happens if an employee just doesnâ€™t fill out the form. Crucially to the definition of a nudge, an employee who doesnâ€™t want that option can costlessly (other than the effort of making the decision) switch to another, or none at all. As long as thereâ€™s no deception involved, and the people designing the choice architecture know what theyâ€™re doing and have the welfare of the people making the choices in mind, nudging seems to me almost entirely benign. A program that doesnâ€™t limit freedom of choice canâ€™t properly be said to reduce liberty, so replacing â€œopt-inâ€ with â€œopt-outâ€ should be thought of as facilitative rather than coercive. The same is true of, e.g., putting the salad bar first in the cafeteria line. However, Cowenâ€™s understanding of nudgery has a much harder edge. He gives examples where a choice less preferred by the government (or whoever is setting up the system) is made materially less attractive or more expensive, such as legally complicated and expensive divorce procedures, or abortion restrictions that force women to travel inconvenient distances. Cowen even wants to call restrictive immigration laws â€œnudges,â€ because would-be immigrants who canâ€™t get visas can always forge documents or sneak across the border! In my view, that sort of cost-imposing policy is radically distinct from â€œnudging;â€ Steve Teles calls it â€œshoving.â€ I donâ€™t doubt that some such â€œshovesâ€ are justified on paternalistic grounds: taxation to reduce cigarette consumption is an example. (Shoves are often justifiable on non-paternalistic grounds, such as taxes to reduce air pollution.) But such strategies arenâ€™t always benign; people who keep smoking in the face of heavy tobacco taxes wind up just as sick as they would have otherwise, and poorer. And of course for those with limited means making something expensive can amount to barring it entirely. Now, I agree with Cowen that the â€œshovingâ€ for paternalistic reasons he wants to label as “nudging” is often preferable to more drastic means of protecting people from their own bad decisions: means that we might call â€œmanhandling.â€ A tax on cigarettes is more respectful of liberty, and less prone to generate bad side effects, than an outright prohibition would be. But â€“ in contrast to nudging â€“ shoving is like manhandling in making those who donâ€™t take the hint worse off. Changing incentives isnâ€™t the same thing as changing choice architecture, and requires much stronger justification. Nudging is no panacea, because changing choice architecture can only go so far in changing choice. Some people will continue to fall into behavioral traps even if the traps are clearly marked. And when the intervention is on non-paternalistic grounds, a considerable amount of shoving, or even manhandling, may be both justified and required. But there is clearly some room for improving outcomes at low cost and without diminishing liberty from the use of pure nudges. Itâ€™s therefore worthwhile to distinguish clearly â€“ as it seems to me Cowen’s analysis does not â€“ between generically benign nudges and the less benign alternatives he wants to include under the same label. A terrible thing has happened to us. It may have just begun. After reflection, I have decided last night was the worst night of my life so far. I am not facing a personal nightmare: I have a secure job and a family, a house, financial security, and (at least for the nonce) most of my wits. But I will probably not live long enough to see things turn around, nor is it certain that they will. My daughters and my studentsÂ are at real risk, as are millions of people I don’t know but who I know are out there. Billions, actually; all the passengers on our warming spaceship. All in all, I have definitely learned how the Trump voters who sense “their world having been taken away from them” feel. Not that they are going to get that world back now; the most ill-used and vulnerable of them are going to pay a terrible price for their day of rage as they learn the iron law of Trump’s deals: his promises mean nothing to anyone including himself, and that goes extra for his promises to them. Others have had much worse nights, including others’ last night, and they have something to tell us, about both despair and hope. We must not wallow in despair, but we must look it in the eye and recognize it. Here is a gallery of borrowed insights, more enduring and tested than a blog post. 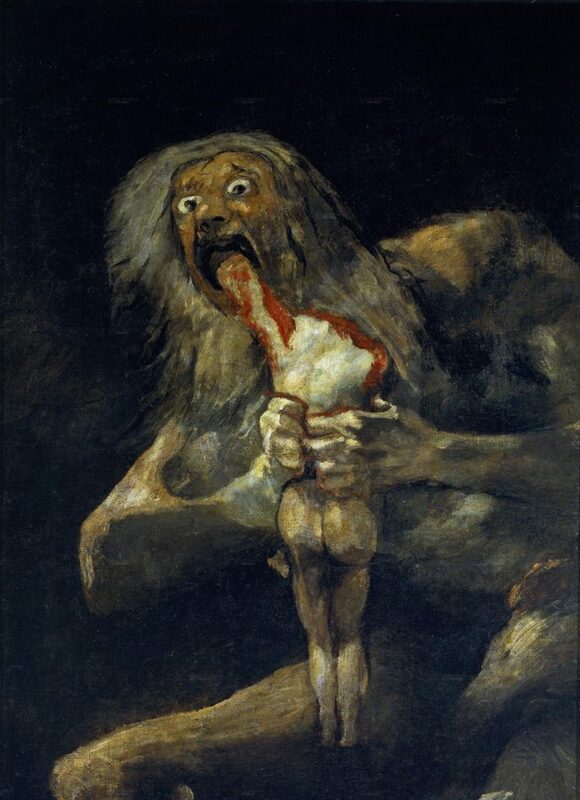 Â First, theÂ picture I cannot get out of my head, Goya’sÂ Saturn devouring his children.Â Now you too will have it forever. Â Look at Saturn’s eyes: he is not angry, or vengeful, or cruel; he is terrified. The election of 2016 was all about fear. Next, Yeats’ anticipation of World War I (“The Second Coming”). It’s a poem; read it out loud. Wagner’s Hans Sachs, of the 16th century white working class (a cobbler), watched his beloved community erupt in riot and violence in the second act ofÂ Die Meistersinger, and reflected thus. Â You must set aside seven and a half minutes, and listen to the end. O gracious Art, for that I thank you! As a service to our readers suffering increasing Ã¡gita, heart palpitations, and pearl-clutching in the next couple of days, the RBC is pleased to provide relief. Here are 150 hrs of guaranteed comfort in difficult times, you can stream it right into Wednesday morning. Â Don’t dally, however; you may need the happy little trees even more in the early days of the new administration, and you should know that the DEA has a rulemaking, in public comment stage, classifying Bob Ross as a Schedule II narcotic:Â it may be much more difficult to access in the near future. I moved to California twenty-five years ago, and there is much to like and admire here. However, I have never made my peace with a particular feckless quality of much about our politics, a willingness to behave in a way that would be appropriate if the world were they way you wish it were, but profoundly dysfunctional in the world as it is. We crippled and stupefied our legislature with term limits to show them how pissed-off we were. After the historic Oakland Hills fire that killed 25 people and destroyed more than 3000 homes, the Berkeley city fathers realized that our adjacent hill area hadn’t burned since 1926 and had built up a significant fuel load. It was proposed to expand the firehouse in that neighborhood…and the neighbors whose houses were most at risk were up in arms protesting that it would be noisy. Berkeley had, for years and years, a million square feet of vacant industrial buildings, because romantic social justice advocates successfully zoned the area for nothing but manufacturing and blue-collar jobs, even though no-one wanted to manufacture anything in Berkeley and never would. Not hi-tech, not artists’ live-work studios, not offices, not low-cost housing for our teachers who can’t afford Berkeley rents: manufacturing. All those blue-collar jobs existed, for decades, entirely in the deliberately ignorant, sentimental imagination of a bunch of people more interested in telling themselves how moral and decent they were than actually improving anything in the real world. At the DNC convention tonight, the California Bernie delegates kept up a constant stream of booing and whining and dissing Hillary, telling interviewers they would vote Green, or not vote in November, even though Bernie, whom they said they trust implicitly and completely, had just told them to get the hell on the reality train and start working for Hillary and a Democratic congress, and against the real Republican nightmare slouching towards the real White House to be born.Â A bunch of Nader voters in the same mold gave us eight years of W, two wars, an economic meltdown, and a Supreme Court that gave our politics to plutocrats. People die from magical thinking when their parents deny them vaccinations, not to mention in stupid wars that those Nader voters could have prevented. I hope their purity of thought comforts them in the face of the misery they imposed on everyone else. Trump is called, with good reason, a narcissist; what about people like the dead-end Bernie solipsists? I worry that some of those self-absorbed luftmenschen in the California delegation went to Cal, and worse, tookÂ my class. 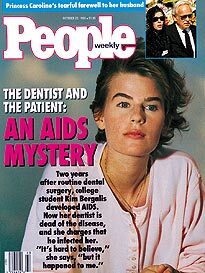 (Maybe they went to UCLA and Kleiman has to answer for them). If so, I will rend my garments and try to figure out how I failed so badly, and apologize to everyone who has to put up with this infantile behavior.Â But I hope they went to Stanford or USC, or maybe Santa Cruz. And I hope in any case that they get their exquisite personal moral excellence engraved on stone tablets…and drop them on their toes. In a series of studies, researchers asked subjects to react to a particular vivid prototype, for example a photo of one bird struggling to escape an oil spill. After being asked how much they would donate to save the bird, the subjects are then asked how much they would donate to save countless birds from all of the worldâ€™s oil spills. Surprisingly, the two answers tend to be similar. That is, people who will donate $10 to save a particular prototypic bird in distress in one location will only donate $10 to save an unspecified number of birds in distress in many unspecified locations. Itâ€™s a stunning finding in that the subjectsâ€™ responses are logically equivalent to saying that birds in general are worthless but one particular bird has significant value. Kahnemannâ€™s interprets such results to mean that human beings often react strongly to prototypes but are insensitive to quantity. The setting and circumstances of Charleston’s atrocity remind me of the manyÂ times that I’ve visited various African-American churches. As a white non-Christian, I’ve always been embraced as a valued guest. That Dylann Roof was accorded similar hospitality, and yet apparently went on to murder the very people who graciously welcomed him adds yet another incomprehensibly depraved element to this attack. We could all use some joyful noise to salve the wound just a little bit. Below are Mahalia Jackson and Louis Armstrong, at the Newport Jazz Festival 1970.